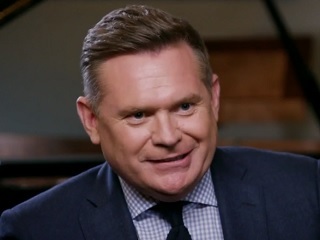 Michael Usher exits 60 Minutes with a bang. After 25 years with Sydney, Australia TV station Network Nine, where Michael Usher earned the nickname “Musher,” the veteran reporter revealed this month that he was headed to cross-town operation Channel 7. Which meant that an interview aired Sunday Aug. 28 on 60 Minutes Australia would be his last for that show. The proper pronunciation of guest Barbra Streisand’s last name, which was also a recent topic of discussion on The Tonight Show, framed the great promo clip above and earned Usher some saucy coverage Down Under. But it is something else said by Streisand that has led to a much bigger round of international headlines. Streisand mused that she will have to move to Australia or Canada if Donald Trump is elected President in November. At press time, this declaration is an above-the-fold headline on The Drudge Report and a premise garnering snickers on Twitter from Trump supporters.